My name is Virpi-Maria Sipilä, and I'm a film and television scientist from Finland. I live with my husband Mika in a town called Kuusankoski, about 130 kilometres from our capital Helsinki. We have two Afghan males at the moment, Mocca & Brandy (also known as Coffee & Cognac). My parents and I have owned Afghans (or maybe I should say we've been owned by our Afghans...) since 1982. Ever since that I had demanded that I absolutely must have an Afghan of my own. Therefore my parents should be counted as "Afghan People" also, as well as Mika, whose days have been brightened by Afghans since 1988. 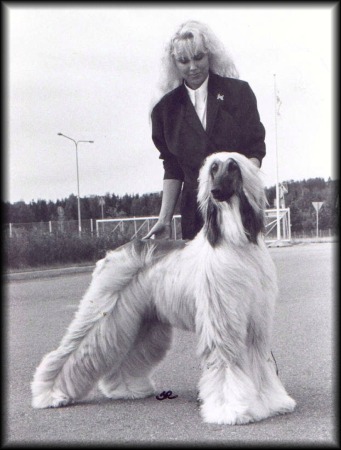 Our first Afghan was Taikatassun Lurjus ("Yamy"), born in 1982, whose sire was International & Nordic Champion El Khyrias La’Bo’Bo from Sweden and dam Finnish Champion Taikatassun Jenga. 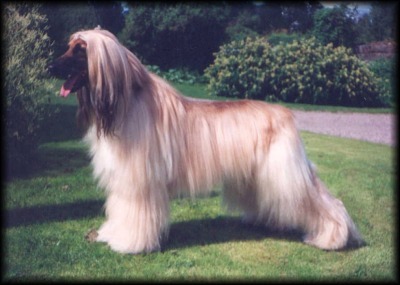 Yamy captured our hearts, taught us what it meant to be "A Real Afghan Hound", an independent and fearless, yet tender dog. 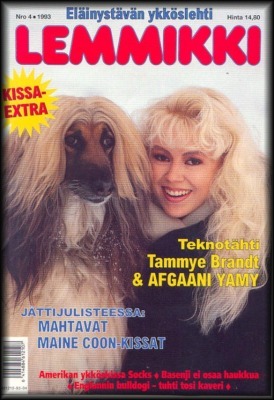 I had a pleasure of posing in a cover of a Finnish pet magazine with him. The magazine told a story about us, because in those days I did some singing under the name of Tammye Brandt. Yamy’s best placement in dog shows was Best of Breed # 2, but I wasn’t too much into dog shows then, and he was shown a few times only. Yamy passed away in 1993. In 1993, after Yamy passed away, our second Afghan came into our lives. He was Taikatassun Pummi ("Rico"), sired by the world-famous Taco, Am Ch Pahlavi Puttin’ On The Ritz out of Taikatassun Frendi. Rico was a wonderful dog and his fans had high hopes for him. 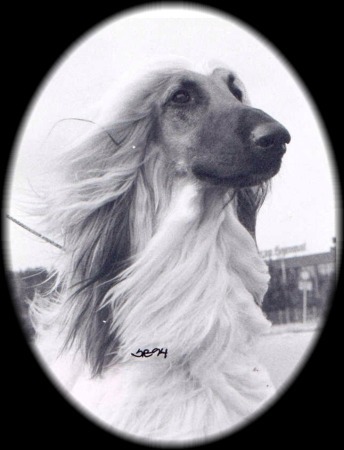 He was Best In Show Puppy in a Hound Specialty, but shortly after he received his first CC he became seriously ill, and unfortunately he died of inflammation of the lung at the age of twenty months. In May 1995, it was time for "Mocca", Finnish & Swedish Champion Xciting Going For Gold, to arrive in our household from Sweden. He’s an interesting mix of Taco’s heritage and Australian lines. You can see more of Mocca on his own page. Because of my studies at the University of Helsinki, my other activities and I was living in the United States, we only had one Afghan with us. There was no time for another one at that time. After I graduated from university, I finally had a chance to have another Afghan besides Mocca, and my "Australian Dream" came true. In November 1999, after waiting for two years, our Ozzie boy "Brandy", Finnish & Norwegian & Swedish Champion Gengala On Thother Side, arrived in Finland. Please read more about him on his own page. We hope you'll enjoy our homepage. Please sign our guestbook before you leave!